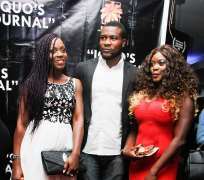 In Pictures At:iquo's Journal Film Premiere, Lagos. The premiere of Blessing Egbe's IQUO's JOURNAL took place on Friday 26th June at the Genesis Deluxe Cinema in Lekki, Lagos Nigeria. The movie which stars Kate Henshaw and Femi Jacobs was very well received. Kate Henshaw who plays the lead female character IQUO could not make it to the event due to the set back she experienced the day before. The movie is written, produced and directed by Blessing Effiom Egbe who wore a Frank Osodi design. Other celebrities at the event were Kiki omeili, Femi Jacobs, Keira Hewatch, Chinonso Young, Emeka Ossai, Teco Benson, Frank Osodi, Ralph Nwadike, Bobby Michael, Deyemi Okolawon, Mrs Akin Salami and Josephine Ewuru who played the younger Kate Henshaw.